A single tooth implant restoration provides the best functional and aesthetic possibilities available in dentistry today. The long-term success of dental implant treatment for this situation is well documented and our team of specialist Prosthodontists can assess the suitability of this treatment to meet your needs. Have you got a damaged or missing tooth? Are you looking to replace existing dental work and want to explore your options? Dental implants may be a great option for you – and the expertise of our Brisbane-based Prosthodontic team can help you make an informed decision when it comes to selecting an appropriate dental implant option. An appealing alternative to dentures and bridges, dental implants are permanent placements that mimic your real teeth in both form and function. In most cases, our dental implants are just like natural teeth and they are even cleaned with dental floss and brushed with regular toothpaste. Do not usually require special cleaning products. A dental implant is an artificial tooth root that is made of titanium and inserted into the jawbone by our team of dental surgeons in Brisbane to replace one or more missing teeth. Similar to a foundation, these implant points form a secure structural base and act as an anchor point for the placement of dental crowns. 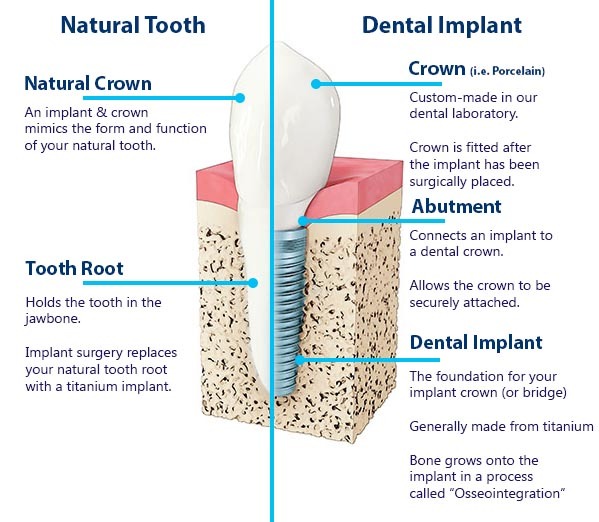 Once the implant is placed, an abutment is attached that acts as a connection between the crown and root of your dental implant (or implants). This abutment provides structural support and allows the crown to be permanently attached to the site of the missing tooth. 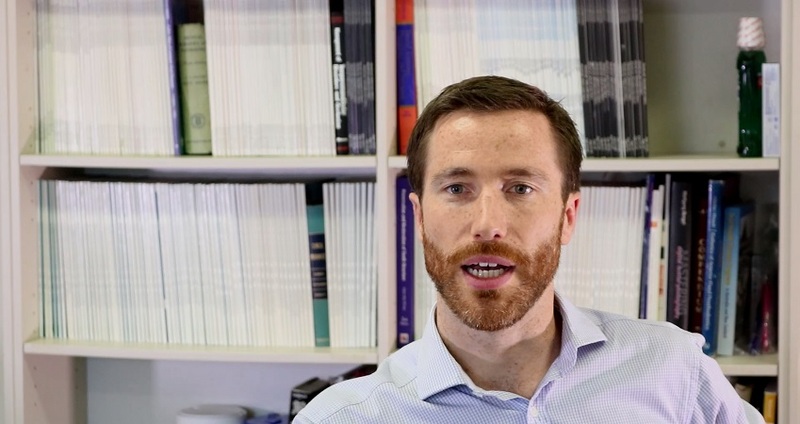 Dr Brian Fitzpatrick explains some of the key ideas and concepts of Dental Implants below. What dental implant systems are available? This depends on your individual needs and dental health, and our Prosthodontists can help you assess the varied criteria that will help you choose the right dental implant for you. For a typical traditional implant treatment, the whole process may take about 12-16 weeks – from the initial placement of the dental implant’s root to the fixing of the crown. However, depending on circumstance, advances in technology may allow you to have natural, beautiful looking teeth in a much shorter time frame. “Research results and advanced surgical techniques permit immediate implant and crown connection on the same day in certain circumstances,” says Dr Fitzpatrick. We can help you assess whether you fit these criteria, and explore the different dental implant systems available for your individual health needs. Our Brisbane based team of Prosthodontic specialists attend international meetings regularly and stay up to date with all modern techniques and materials in dentistry. As research progresses rapidly in the area of dental implants & Prosthodontics, we constantly evaluate new advances in surgical and clinical protocols and provide the best treatment options available. It is our commitment to only introduce new technology into the practice when it is deemed safe and predictable for you. From advances in micro-surgery, to same-day tooth replacement techniques, our Prosthodontic team will endeavor to provide our patients with less invasive treatments, rapid recovery and a quicker delivery of results. Any surgical or invasive procedure carries risk.